First, I need to make something crystal clear. It’s not “MY Higher Christ Self or YOUR Higher Christ Self,” it’s “THE Higher CHRIST Self.” There is ONLY one of them and He has a name. This is all part of the truths (plural), and the quest for “the truths.” I do want to point out however that technically, He is yours, and yours, and yours. He is One WITHIN the One. Religions have been teaching wrong; over and over again. Even some of the Masters are saying Your, because He is yours, but also everyone else. This also goes for “new age” people that call themselves; Lightworkers. Many just repeat old writings, thinking that they are helping others, by consolidating other written materials. This is TERRIBLY misleading. You MUST do “The Work,” and follow “The Way;” through your heart and not your head. You CANNOT learn this from others; merely be guided. This is exactly what the incarnate Jesus did with His disciples; taught them. They did their best to teach you, but things still have been misinterpreted. This is what I attempt to do for my readers, teach them to use their own knowingness, in conjunction with wisdom and intellect. This is The Truths from THE Higher Christ Self, who HAS a name. You MUST ASK, or request his name; in order to RECEIVE it, and resolve the mystery around it. This is where YOU must “test the spirits,” comes from; in the Bible. YOU must do it yourself. Just believing, and not doing is futile. NOBODY can do it for you and “save” you; you MUST save yourself, through His teachings, which are found throughout all religions. The power of The Words “I AM” are an incredible gift to us. Through the years these words were written I am. The power has been taken from us by this slight change in capitalization. This all has to do with the “weight” of words. As many of you know, WHEN I WRITE LIKE THIS; I’M YELLING AT YOU. The same concept goes when we SAY the words I AM and other words in general. All words carry “weight,” because they are “data.” How they are used create “demands” or “commands.” You can read about it in my channeled message called, The Weight of Words in one of my blog article, or on my website in its raw, channeled form, 1/15/18. As THE Higher Christ Self told me, “There is data in the words and the data is the weight; and the weigh equals the data.” I HIGHLY recommend that you read at least, one of the above mentioned articles. To begin, I’ve stated before that I call “The One;” “The Holy Father.” This is how THE Higher Christ Self refer to Him, when speaking to me as well. I “hear” the creator, literally as a voice; a loving Fatherly voice. He is all-loving. The Holy Father, or “God” as some refer to him as being, does NOT do anything bad to you; EVER. Anything unpleasant that happens during your life, should be looked at as a “learning experience,” because that is EXACTLY what it is; a lesson in how you will react to it, while you are in “Earth School.” Will your response be through your head? OR will it be through your heart. THEN, you must find the blessing in it; no matter how small it might be. By doing so, you WILL receive Grace. I not only hear Father through my sacred heart, but I inter-dimensionally travel to The Holy Father, and we talk; face-to-face. All are welcome to converse with Father while in their physical bodies, however, a true master travels; inter-dimensionally to The Holy Father. This naturally occurs for me when visiting with THE Higher Christ Self; inter-dimensionally; out-of-my-body. I first “hang out” with Him, The KING of the CHRISTed Kingdom (who has a name,) then Father pops in for a visit. This is “the only way to the Father;” inter-dimensionally. Because I AM a “virgin” daughter of a God on High, I do not have to do it that way, but it’s such a seamless transition, and a much easier for me. You can always talk to Father while in your vessel, as He is you and you are Him, but if you want to “sit with him;” WITHIN his energies, The Way to Him is inter-dimensionally; through “The Son.” my divine husband and twin flame; Coeus, God of Intellect who is THE Emmanuel (THE God With Us) or THE Higher Christ Self. I am hearing errors in New Age channeled messages about New Earth. I have heard it called the “Christa Kingdom.” This is incorrect, it is the “CHRISTed” Kingdom or the “Kingdom of CHRIST.” As you can probably tell by saying these words, they sound quite similar, “a” and “ed.” THE Higher Christ Oversoul or Self is the King of this Kingdom, and I, the Goddess Athena is His Queen and wife. And we know that the Son of God has come and has given us understanding, so that we may know Him (THE Higher Christ Self) who is true (the speaker of the truths); and we are in Him who is true (of the truths) — in His Son Jesus (the vessel housing THE Higher Christ Self) Christ. He (The Holy Father) is the (only) true God and eternal life. I know this to be true, based on the channeled messages from THE Higher Christ Self; the Yielder of the Vernacular Sword and Speaker of Truths. He has made all of this quite clear; especially the last statement, “He is the true God and eternal life.”, as there is ONLY ONE “true” God; The Holy Father. You can see how much of the truths have been lost through dialects, or possibly even intentionally left out of doctrines and other conveyed materials. The churches have been teaching wrong, and they are the ones that are blasphemous. As you can see, things are NOT as they appear. Use your knowingness when SEEKing out the truths, as they are deeply hidden. Think from your heart; not your head. You ARE spirit having a physical experience; just like the God Coeus, who incarnated into an organic body suit named Yeshua (Jesus / Iesus). The “true understanding of the Self,” is the most important thing that you can possess. Without this understanding of your real self; your CHRISTed Oversoul (you have ONLY one), we can’t really integrate it into our lives, and reach our ultimate goal; Lightbody, and live in the Body of Light on New Earth. This body is one of spirit; not of the physical, although it will have a “physical” appearance. This is a story of “cause and effect.” We call this “cause” the I AM THAT; I AM, the Presence of the I AM, or the I AM Presence; God/Father/Mother. Whatever you want to call this energy; just CALL this eternal Presence! The “effect” part of cause and effect is eternal life in the most beautiful of form. There is a small sphere of intense light that marks the point of all our origins. It is a permanent part of us; “I AM the beginning and the end.” “The Alpha and Omega.” “The One; love at its divine perfection; unconditional,” and per THE Higher Christ Self, we are “ONE within the ONE.” If you think of The Holy Father as the body, you are one of the cells in it; the church if you wish. No matter what you have done in this lifetime, or any past lifetime, know that you are loved and you ARE love. Nothing can change how you perceive your “SELF;” but YOU. So stop beating yourself up…please. This picture is originally from Elizabeth Claire Prophet. It depicts the “Real Self,” in relationship to the “Outer Evolving Self.” The picture itself is actually correct, however the middle being that you see is “THE Higher Christ Self;” NOT “your,” or “my” Higher Christ Self. THE implies; ONE, as He is also “ONE within the ONE. I can’t say this enough, There is ONLY 1 Higher Christ Self, and like I said, you MUST ASK His name or you will not know the answer to the mystery. He is NOT exclusively yours either; as he belongs to the ALL WITHIN the ONE. THE Higher Christ Self resides outside of you, somewhere WITHIN the Higher Chakras system; outside of your body, above your head, and The Holy Father. THE Higher Christ Self has been knocking on your “temple’s door” forever, wanting you to connect with Him, and once again reunite you, with The Holy Father; through Him. Some have accomplished this within their bodies, but the ultimate goal is to connect with The Holy Father; inter-dimensionally and sit in The Holy Father’s light; which is amazing! This picture can be understood best as a 3-part chart that represents the Trinity; The Father, The Son, and The Holy Spirit: YOU! Yes, you are the holy spirit, and you, and you, and you! The Son is the “firstborn” son of The Father. This is important to remember, as Christianity messed it up in dialect. The Son also has a Mother. They removed one word from “the firstborn (?) son of God” that tells you EXACTLY who He is in spirit. The upper figure is the “Sphere of Light;” The Holy Father. Some people have been experiencing The Holy Father, but are quite unaware of it. When you SEE The Holy Father, His truths will appear as a beam of light shining down upon you; much like in the picture. You will probably freeze when this happens. I talk about this in another article on my blog. Sometimes, when I sit with The Holy Father; inter-dimensionally, I get so excited that I get pulled or drawn back into my physical form. This is called, “slipping away.” THE Emmanuel or Coeus tells me, “Your fighting it,” and that is what causes me to “slip away.” When he said this, I felt that I was trying to focus on Father’s energy, out of fear that I’ll lose him; but He; THE Higher Christ Self knows best. If this happens to you, just relax and let it flow. The Son (the middle floating being) ALWAYS calls Him (Father), “The Holy Father,” as there is ONLY one true God, The Holy Father; the Son; THE Higher Christ Self’s words. Once again, the Son or 1st born son of “God;” Coeus is “The Middle Way.” He is THE CHRISTed Oversoul of the incarnate man called, Yeshua / Jesus / Iesus that is talked about it in the Bible. This CHRISTed Oversoul, or THE Emmanuel is the God with Us, who was the God inside of the organic body suit of Yeshua / Iesus / Jesus. Why nobody has ever mentioned this fact while channeling “their” Higher Self astonishes me. I can only assume that they never used their knowingness, with wisdom and intellect, and Asked, “Do you have a name?” They only followed previously written or verbally channeled materials; following along blindly. “Lord,” said Thomas, “we do not know where You are going, so how can we know The Way?” Jesus answered, “I am The Way, the Truth, and the life. No one comes to the Father except through Me. If you had known Me (or asked my name), you would know My Father as well. Coeus is also known as the Yielder of the Vernacular Sword, Speaker of Truths, and the Keeper of Mystical Wisdom. NOTE: I want to point out that the people that compiled the books in the Bible, changed capitalization’s (The Way and Truth) and some other words. They did NOT understand some of the Hebrew words and concepts that “flesh” or man, Jesus spoke about in his teachings. These words are actually clues to who THE Higher CHRIST Self actually is; “in spirit.” They also left out all the “magical” or “mystical” materials that would help with the journey. Let’s face it, if the journey was simple, there would not be any point of incarnating and talking the talk, AND walking the walk. The lower figure is YOU, the Evolving Soul Self. This is a part of your CHRISTed Oversoul from the CHRISTed Kingdom that was put into an “organic body suit” or vessel for your physical experience. You are energy that is “evolving matter” in time (or lack thereof) and space. This is your evolving “personality” during the illusion, or “game;” the one that collects all the karmic or “growth” experiences. The one that needs a good house cleaning! You are trying to evolve and get in touch with your “true name” or CHRISTed Oversoul the one that YOU incarnated FROM for your earthly experience, and left behind to “guide” you. You will only receive this name when you inter-dimensionally travel to THE Higher Christ Self. I urge you to read the channeled message on my website, The Inter-dimensional Traveler. It talks more about this, and my actual experience with THE Higher CHRIST Self, when he presented me with my CHRISTed Oversoul name. 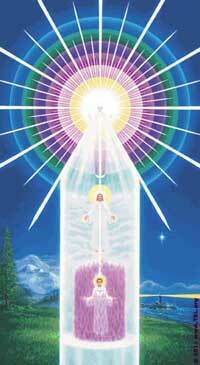 One of the MAJOR parts or “processes” of Ascension, is to once again REMEMBER the spirit world. To communicate with the HIGHER aspects of it; not ancestors who MAY reside in the lower light realms, or Earthbound entities (ghosts.) Although this may be pleasing to many, it CAN and WILL hold you back from achieving your ultimate goal; the face-to-face meeting of THE Higher Christ Self, and the integrating or merging of your CHRISTed Oversoul into your “physical” body or “vessel.” That is what you MUST focus on; not the little pleasures, as it is The ONLY Way to New Earth. “When the Comforter would come; Whom I shall send to you from the Father, the Spirit of Truth, (or Truths) the One who goes out from the Father, that One will testify (talk) about Me. These are MAJOR clues to the identity of THE Higher Christ Self in the Bible.